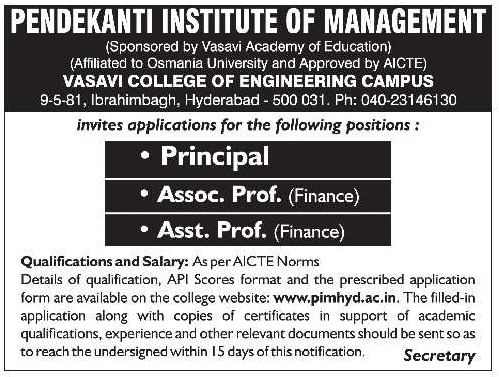 Pendekanti Institute of Management, Hyderabad has advertised in the EENADU newspaper for recruitment of Associate Professor / Assistant Professor / Principal job vacancies. Interested and eligible job aspirants are requested to apply within 15 days from 26th March 2019. Check out further more details below. About College: Pendekanti Institute of Management (PIM) is established in 1991 and is the youngest among the academic institutions started by Vasavi Academy of Education (VAE). Vasavi Academy of Education is a non-profit society registered under Societies Registration Act was founded in the year 1980 under the able guidance of its Chief Patron, (Late) Sri. Pendekanti Venkata Subbaiah, former Union Minister of State for Home and Parliamentary Affairs and Ex-Governor of Bihar and Karnataka. Vasavi Academy of Education is dedicated to the cause of development in the field of basic and professional education. How to Apply: Interested candidates are requested to send application in prescribed format along with copies of certificates and recent passport size photo to the postal address provided below.